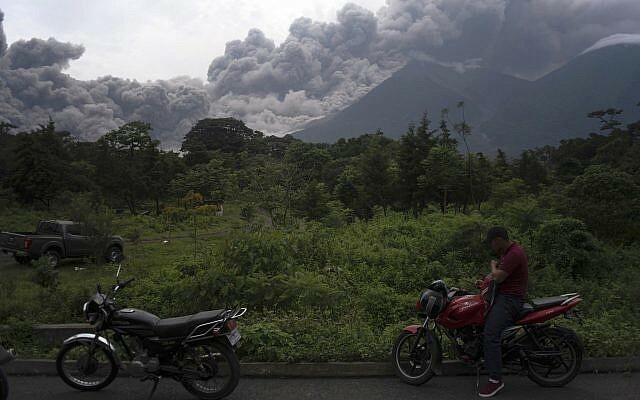 One of Central America’s most active volcanoes has erupted in fiery explosions of ash and molten rock, killing at least 25 people and injuring many more. Guatemala’s Volcan de Fuego, Spanish for ‘volcano of fire,’ exploded shortly before noon local time and hours later lava began flowing down the side of the mountain. Three bodies lay partially buried in ash-colored debris from the volcano, which lies about 27 miles from Guatemala City. ‘Not everyone was able to get out. I think they ended up buried,’ Consuelo Hernandez, a resident of the village of El Rodeo, told the newspaper Diario de Centroamerica. ‘Where we saw the lava fall, we ran to a hillside’ to escape, she added. National disaster coordinator Sergio Cabanas said seven people were confirmed dead and an unknown number were unaccounted for before the figure was later revised. Among the fatalities were four people, including a disaster agency official, killed when lava set a house on fire in El Rodeo village, Mr Cabanas said. Two children were burned to death as they watched the volcano’s second eruption this year from a bridge, he added. 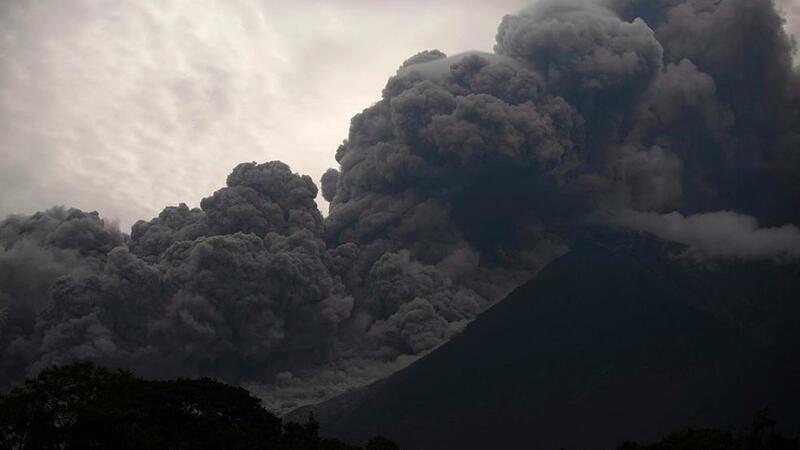 Guatemala’s disaster agency said 3,100 people had evacuated nearby communities, and ash fall from the eruption was affecting an area with a population of about 1.7 million of the country’s 15 million or so people. Shelters were opened for those forced to flee. The conical Volcan de Fuego reaches an altitude of 12,346 feet (3,763 meters) above sea level at its peak. The G13 – an international group consisting of leaders of the heads of government from Canada, France, Germany, Italy, Japan, the UK, the US and Russia, plus Brazil, China, India, Mexico and South Africa – has offered its support to those affected by the volcano eruption in Guatemala. ‘The G13 is at the disposal of the Guatemalan authorities to help with the £VolcanFuego tragedy and sends its condolences to those affected,’ a tweet on the official account for the British Embassy in Guatemala said. A Briton who climbed the neighbouring peak to a volcano in Guatemala a day before at least 25 people were killed in an eruption has told how he feels ‘fortunate’ to have escaped harm. The Foreign Office has told Britons visiting and living near the capital, the city of Antigua and areas near the volcano to keep up to date with local officials’ advice. 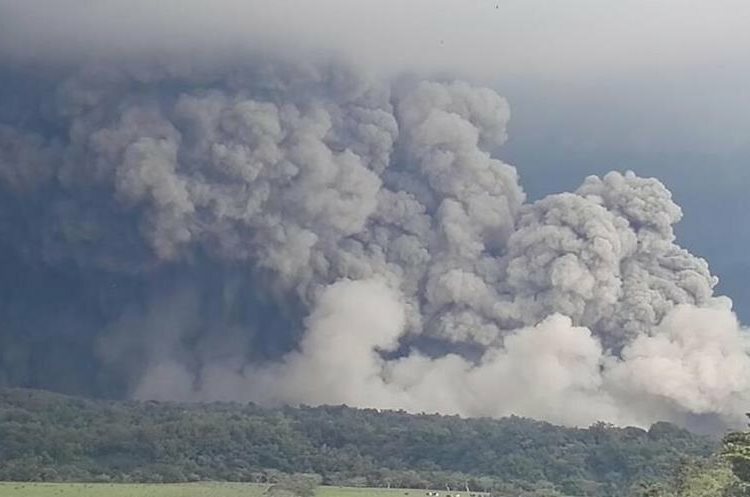 Richard Fitz-Hugh, a backpacker from Beaconsfield, Buckinghamshire, spoke to the Press Association from ash-covered Antigua, around 11 miles from the erupting volcano. The 24-year-old trekked to the base camp of Acatenango, which lies around two miles from the deadly Volcan de Fuego, on Saturday. ‘It was fine then, erupting as normal with lava flows but it was a lot worse today,’ he said. ‘We heard about six people who were killed and more who were injured, that was at the foot of the volcano. Tourists can take guided tours up the Volcan de Fuego’s neighbour to view the frequent volcanic activity. ‘We knew it was active, it’s all part of the experience, you go up and see the lava, that’s the point of climbing Acatenango,’ Mr Fitz-Hugh said. Despite its relative proximity to the deadly volcano and ash covering cars, roads and buildings, life appeared to be continuing as normal in Antigua. ‘In the town ash came down for about two hours mid-morning and shortly in the afternoon and it sort of mixed in the rain,’ he said. The Foreign Office advised Britons travelling to and from Guatemala to check with their airlines after La Aurora International Airport closed until at least 2pm (8pm BST) on Monday.